On Tuesday 6 November, US will proceed with the off-year elections, occurred every 4 years, before the presidential elections. The particular mid elections is expected to affect the markets as the outcome of the election will be important for the future of the President and for the control of the Congress. As the Republicans control the 54.4% of the House and 51 out of 98 seats in the Senate, it will be interesting to see whether Republicans manage to keep the control of the Congress. The control of Congress will certainly have an significant impact to any future fiscal policy judgements, as each of the parties could have the power to pass their legislation proposals or to vote against opposing legislation agendas. Therefore the Tuesday’s voting will have without a doubt an impact in equity markets. Based on the history of US Presidency, we rarely saw so far the Republicans holding the control of the House and Senate, and even more rarely to remain in charge after the mid-elections. The most of the surveys the last few months suggest that there is a high risk for Republicans to be deposed, while FiveThirty Eight website gave 80.7% to the Democrats holding the House, and 69% to Republicans of holding the Senate control. From the markets perspective, the US Equity market has seen reacting on any outcome of mid-elections positively. More precisely, as Rathbones Brothers state, “US equities tend to be rather directionless in the six months before a midterm election, with a little extra volatility. Over the subsequent six, equities tend to rise steadily “. 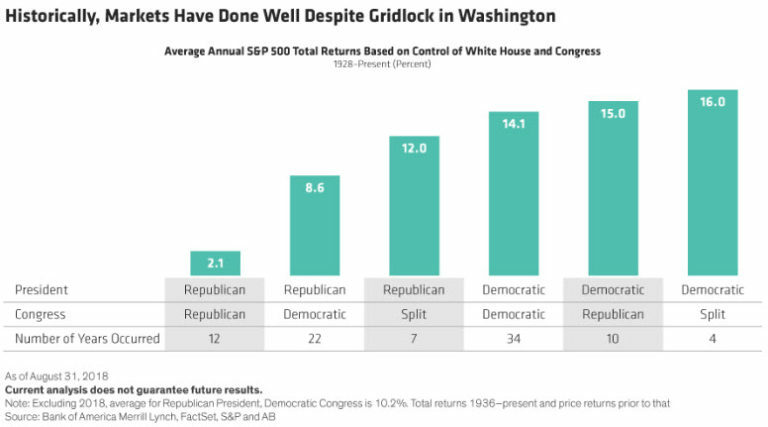 In the past three mid-term elections, where Congress’s control changed hands either overall or part of it, the US equities remained on the upside movement. Therefore, it seems that in general mid-elections result , i.e. which party losses/gains/keeps the control of the Congress, is not directly correlated to the US Equities or the global market. Taking as an example the 2006 elections where Democrats took the full control of the Congress with a Republican President, and USA remaining in an upside trend. Similarly to USA500, the US Dollar has not been affected from its prior-elections direction. However despite the historical performance of US equities and US dollar, if we turn back in politics and the current US economic performance, it is not unlikely to see any extraordinary movements in the market in case that Democrats retake the control of the house. Based on the fact that US economic growth is doing extremely well the last year, a democratic sweep of Congress could have a negative impact on US equities. Meanwhile, in Democrats manage to gain the control of both house and Senate, then it is likely to see US equities facing an even stronger negative momentum. In this case, the hopes of a democratic member to win the 2020 elections will rise, while there are risk of legislation changes from Democrats ( i.e. reduction in corporate tax, changes in budget balance) or block of presidential appointments. Hence this could have a direct impact on US economy and of course US stocks, which have been boosted from Pres. Trump’s tax plan. On the fiscal policy perspective, Democrats as they already mention in the past, that they believe on the spending on infrastructure programme. This could help the industrial and material sectors to That could be good news for the industrials and materials sectors of the equity market—and possibly good for bond yields if Congress raises taxes to pay for it. In conclusion, there are 3 scenarios for Tuesday’s Congressional election — a GOP sweep, a Democrat sweep, or a split with Democrats taking back the House and Republicans maintaining their Senate majority. As mentioned, with history and poll on their side, the markets’ base case is the split. Meanwhile, the big risk seems to be a potential Democrat victory – in either the House or the Senate, which would severely crimp President Trump’s agenda, including fiscal and regulatory issues. President would be unable to enact the remaining policies on his to do list, and hence he may focus all of his attention on the one thing for which he does not require Congressional approval: stoking the trade war. The potential for gridlock in Washington might be taken relatively bullishly by the bond market as increased fiscal stimulus would be in doubt, Wall Street may not like the headwinds to further economic growth. Were the Republicans able to maintain control of the legislature, the president would have virtually all policy options open to pursue his domestic and international agendas. That would likely be a more bullish outcome for equities, and further pressure Treasury rates higher, both on beliefs of stronger growth, and a potentially more hawkish FOMC.